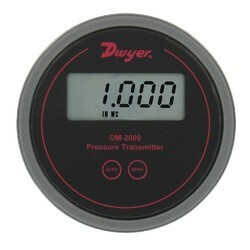 Differential Pressure Gage Offering you a complete choice of products which include Differential Pressure Gage such as Aerosense Differential Pressure Gage, Dwyer Digi Mag Digital Differential Pressure Gage and Dwyer Differential Magnehelic Gage. MORE ABOUT THIS ITEMThese low-cost, compact transmitters reduce up-front costs as well as expenses over the life of the product. These transmitters are ideal for building automation applications such as air handlers, duct pressure, variable air volume, and filter monitoring. With the One-Touch digital push button, both zero and span are calibrated simultaneously. Just let the unit sit at zero reference pressure, then push the button. Mounting is simple with integral mounting holes on the molded housing; unit can also be mounted on a 35-mm DIN rail. A protective cap snaps directly on to the housing to cover wiring terminals. Cost Effective for B.A.S. Applications, Digital Push-Button Calibration with One- Touch Transmitter Technology.The Series 616K & 616OT Differential Pressure Transmitters with One-Touch technology are designed for simplicity making them the ideal choice for installers and maintenance professionals.The One-Touch Differential Pressure Transmitters are cost-effective, compact transmitters that reduce up front costs as well as expenses over the life of the product. 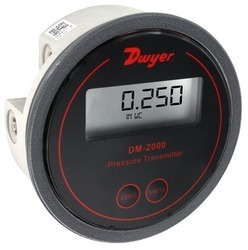 The Dwyer Series DM-2000 Differential Pressure Transmitter senses the pressure of air and compatible gases and sends a standard 4-20 mA output signal. The DM-2000 housing is specifically designed to mount in the same diameter cutout as a standard Magnehelic gage. A wide range of models are available factory calibrated to specific ranges. 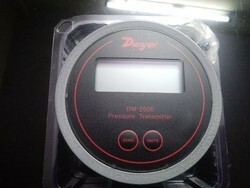 Differential pressure transmitter, range .100" w.c., 24.9 Pa, 2.54 mm w.c., .249 mbar, with LCD. Accuracy: ±1% F.S. at 70°F. Pressure Limits: 10 psig (0.69 bar). Thermal Effect: ±0.055% F.S./°F (0.099% F.S./°C). Zero and Span Adjustments: Digital push-button zero and span. Loop Resistance: DC: 0-1250 ohms maximum. Current Consumption: DC: 38 mA maximum. 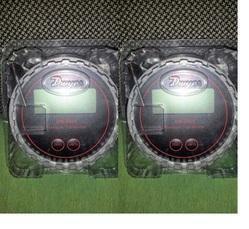 Display: 3.5 digit LCD, 0.7" height. Process Connections: 1/8" I.D. tubing. Differential pressure transmitter, range .250" w.c., 62.2 Pa, 6.35 mm w.c., .622 mbar. Differential pressure transmitter, range .500" w.c., 124.3 Pa, 12.70 mm w.c., 1.243 mbar, .124 kPa. A wide range of models are available factory calibrated to specific ranges. 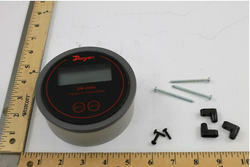 Pressure connections are inherent to the glass filled plastic molded housing making installation quick and easy. 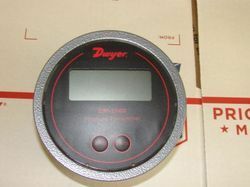 An optional 3.5 digit LCD shows process and engineering units. 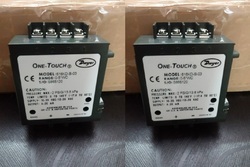 A single bush button allows field selection of 4 to 6 engineering units depending on range on LCD models. Differential pressure transmitter, range 1.00" w.c., 249 Pa, 25.4 mm w.c., 2.49 mbar, .249 kPa. 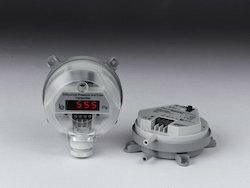 Differential pressure transmitter, range 2.00" w.c., 497 Pa, 50.8 mm w.c., 4.97 mbar, .497 kPa. 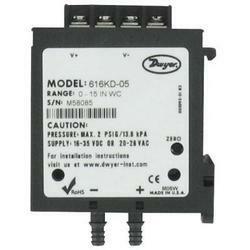 Differential pressure transmitter, range 3.00" w.c., 746 Pa, 76.2 mm w.c., 7.46 mbar, .746 kPa, .108 psi. Size Range .500-0-.500" w.c., 124.3-0-124.3 Pa, 12.70-0-12.70 mm w.c., 1.243-0-1.243 mbar. Differential pressure transmitter, range .500-0-.500" w.c., 124.3-0-124.3 Pa, 12.70-0-12.70 mm w.c., 1.243-0-1.243 mbar. Size Range .05-.200" w.c., 49.8 Pa, 5.08 mm w.c., 498 mbar. Differential pressure transmitter, range .05-.200" w.c., 49.8 Pa, 5.08 mm w.c., 498 mbar. 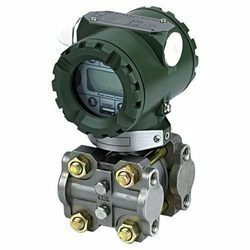 Differential pressure transmitter, range 5.00" w.c., 1243 Pa, 127.0 mm w.c., 12.43 mbar, 1.243 kPa, .180 psi. Size range .250-0-.250" w.c., 62.2-0-62.2 Pa, 6.35-0-6.35 mm w.c., .622-0-.622 mbar. Differential pressure transmitter, range .250-0-.250" w.c., 62.2-0-62.2 Pa, 6.35-0-6.35 mm w.c., .622-0-.622 mbar. The SERIES 616KD Differential Pressure Transmitters with One-Touch® Digital Push- Button Calibration Technology are designed for simplicity, making them the ideal choice for installers and maintenance professionals. These instruments not only alleviate cumbersome turn pots typically found in most transmitters, but eliminate entirely the need to span the instruments during calibration. 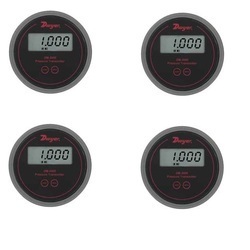 With a single digital push button, both ZERO AND SPAN are calibrated properly, nothing else is required. 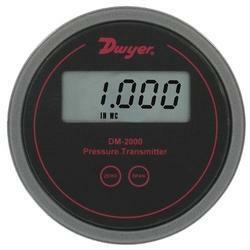 No additional reference pressure sources or separate calibration devices are necessary. 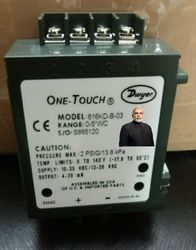 Looking for Differential Pressure Transmitter Wholesaler India ?